The Daily Tiffin: Meet My Baker! Allow me to introduce the man responsible for all the wonderful bread creations that are used in Soeren's lunch boxes and enjoyed by us at dinner time: Herr Becker ("Herr" being German for Mr.). Soeren and I are forever joking with him and call him "Herr Becker der Baecker!" - Mr. Becker the Baker. He takes it lightly and with humor. That's one of his many qualities - he is not just a brilliant baker but a kind hearted soul, always smiling and despite the size of him he is as gentle as a lamb. His family is equally wonderful and each one of his five ladies help out at the bakery: his daughters Katarina, Katy, Kim, Keila and his wife Kathrin. I decided to revisit this post I had written to start a German Bread series a while back. Unfortunately, as many things so happen, I never got around to it. But thanks to Bee and Jai who reminded me about it. Both liked it and were charmed by this article so much and wanted to know more about my bakery and German bread and so they asked me to take part in their wonderful postcard series. So, I decided to re-write the article, dust it up and bring it out again. I am sending this with hugs and love to Jugalbandi's postcard series. Visiting the Beckers at their bakery is never just an in-and-out routine, but an event. We always bring enough of time with us, because there will be a lot of chatter, a bit of gossip and a lot of tasting. Being his favorite customer, Soeren is allowed to go into the back and always taste one of his new creations that "he is currently in the middle of testing" - a new cake, cookie type, or bread. The bakery produces (mostly) organic breads and pastry and the thing I really like is that Herr Becker is always trying out new things. Kneading and mixing up concoctions, always busy and always with a huge grin on his face. In a week we visit the Beckers 3 to 4 times, buying mostly fresh bread, buns, rolls and pastry. It really is hard to choose one favorite when the variety is so huge, but we have found a few favorite breads we like to buy regularly. That is till the next time Herr Becker comes up with a new bread creation - who knows it might just become one of our new favorites. Bakeries in Germany sell their large selection of breads in uncut loaves. They are all piled and sorted nicely on shelves behind the glass sales counters. 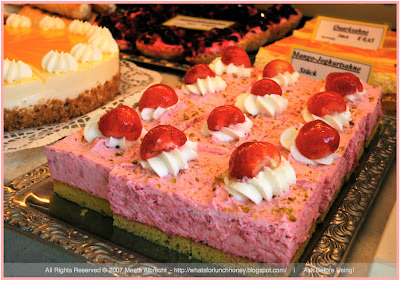 In the glass counters you are disillusioned by the colorful selection of wonderful pastries, cakes and cookies. I think if I was ever left in there at my own risk I would dive into the counter - one of my more crazy fantasies! The loaves of bread are sold by weight and depending on what's in them. One of the very best moments is to come home with a bread that is still warm, cutting a slice with the bread knife and the aroma of this wonderful freshly baked good spreading throughout the house, getting some fresh butter out of the fridge and spreading it on the slice. As the butter melts and trickles into the bread you take a huge bite. UMMMMMM! Heavenly! 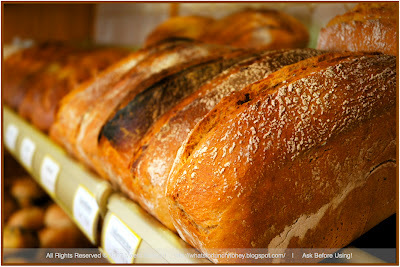 Did you know that there are at least 300 types of bread to choose from? I think however that, that is just a rough basic number and in actual fact the number is a lot higher. "Brot" is a fundamental part of German food. You will find a "Baeckerei" (bakery) at any street corner and when we ask any of our friends and family living abroad what we should bring with us, the answer is always the same - "Some of that lovely German bread!" A typical bread mixes wheat and rye flour to form the basis of the traditional German bread. Other popular ingredients also include oats, barley and spelt, or onions, nuts, special types of grain, herbs and spices. Something we really enjoy eating at our home is probably the darkest bread ever: Pumpernickel. It consists mainly of grainy rye flour and isn’t baked but steamed. This makes it very firm and juicy with a slightly sweetish flavor. As it stays fresh for a long time it is a handy gift for friends and relatives living outside Germany. What I like about many bakeries here is you can often buy just half of a loaf. Which I do very often. I buy a half of one type and half of another type. This way I have a variety and it does not spoil that quickly. So, maybe some of you can understand why I never wish for a bread machine on my Birthdays or for Christmas. Why should I when Herr Becker the Baker is just around the corner? With this I am starting a new series on the Daily Tiffin. 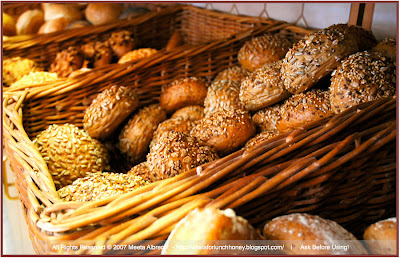 I hope to show you the many varieties of breads, rolls and pastries available in a normal everyday bakery. The upside though is that Swedish bakeries are quite lovely as well. Maybe we should do an international bakeries-article week? we need mote german bakeries in the u.s. we know someone who used to drive several hours each weekend from ohio to pennsylvania to get bread at the german bakeries. That was a lovely and very informative post Meeta. Thanks for sharing! The breads and the pastries look deliicous. My mom would go ga-ga over this... she's a baked products freak and is a traveller! maybe one day she'll come just to try those babies! Oh Meeta I love it - I'm envious of the comraderie you share with your baker! Can't wait to see all of the wonderful profiled items you will be writing about! I've wondered who was behind all that good stuff. Too bad he doesn't deliver to Alaska. And my daughter would love practicing her German on him. Really glad you enjoyed this post! ANON - It's what i miss the most when we are on vacation. Healthy German bread! 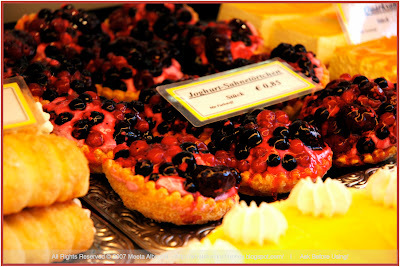 The bakeries around the world are just no comaprison to what you find in a simple regular German bakery! JG - It would be my pleasure to send you a care package to Sweden. Mail me your address and I can send you at least some pumpernickel! I also just love your idea about holding an International Bread Week series. Let's discuss it on email a bit more, with the other girls! Helen - funny you should say that. When I was writing this I was thinking "Helen and Gilly will love this one!" Bee - NO you guys need to come to Germany so I have a chance to show you around!! Latha - Glad you liked it. Time to visit us in Germany I would say!! Gilly - I've been collecting ohotos and a bit of info on all the breads I have been buying so now I just need to pen my thoughts down. I kind of knew you would like this!! Michelle - You really did not think I was baking this myself - shoot I should have left you all in that illusion!! Your daughter can practice her German with me if she likes LOL! 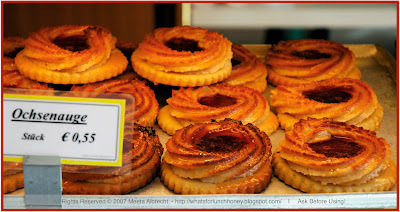 meeta, i always wondered where u find all that yummy looking breads in soren's tiffins.nic ewrite up. wish i had a homely baker like that near me.